I've heard good things about Yojimbo for quite some time. But when Bare Bones Software released the companion Yojimbo for the iPad app, I decided that this was something I wanted to investigate for my "staying organized" workflow. 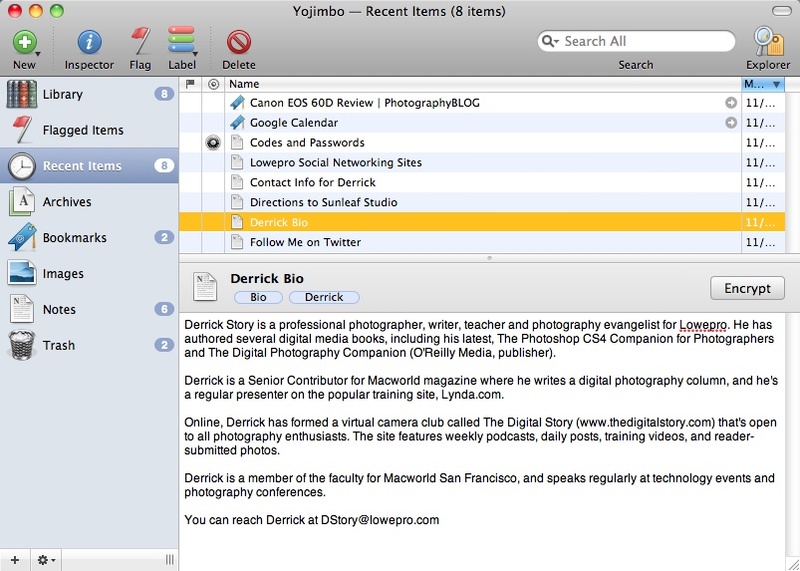 The Yojimbo interface on the Mac is clean and easy to use. Click for larger version. Basically it works like this. While you're working on your Mac, you can copy bits of information that you want to hang on to and put it in Yojimbo. This can be all sorts of stuff: bookmarks, notes, flight numbers, hotel reservations, directions, etc. Once your data is in Yojimbo, you can tag, label, or add a comment about it. Finding the info is a breeze via search or browsing, even if you don't tag. Here's where it gets even better for the nimble photographer. 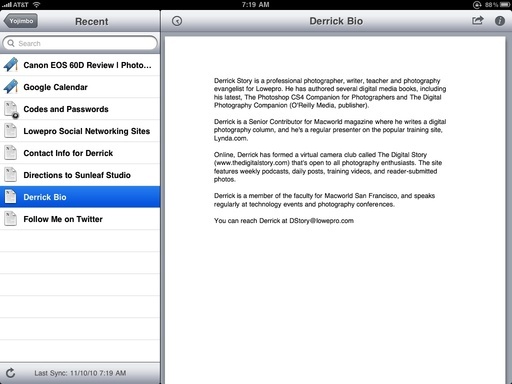 If you get the iPad app too, it syncs with your desktop version. Both devices have to be on the same network, and boom, you have your complete cache of Yojimbo data right there on the iPad. And for sensitive data, you can encrypt it on the Mac and the iPad honors that encryption. You can sync your Mac data with the iPad via Yojimbo for the iPad. Click for larger version. This is particularly helpful when traveling. It's much easier to pull out the iPad to check hotel information than to fire-up the old laptop. I tested this duo with a MacBook Air and an iPad, and it was a joy to use. One thing to keep in mind, however, is that this is a one-way street. The data management is always on the Mac. The iPad is a display-only version of your Yojimbo data. You do have the option to move the data from the iPad via email, but that's about it. 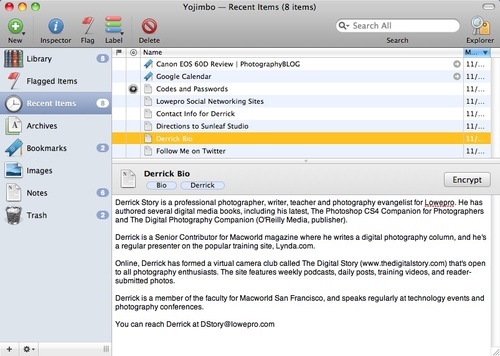 If you're challenged by bits of information that you want better organized, take a look at Yojimbo for the Mac ($39). And if you have an iPad ($9.99), they make a good team. Yojimbo is one of those apps that always seemed to have way more hype and excitement around it than it seemed like it should have... but I'd never really checked it out. One thing you could do Aaron, is download the free trial of Yojimbo and make the comparison. One thing that I like about Yojimbo, but it's a bit of a personal thing, is how well it is written. The operation and UI are quite good. I like the demo of Yojimbo I tried, but $10 for a read-only version for my iPad? Too much. But aside from that, one other quibble is really with the iOS -- Yojimbo won't sync until you launch it. So if you leave the house but forget to launch Yojimbo first -- your data isn't up to date. This happens to me all the time with Instapaper. What a pain. The big difference between Yojimbo and Evernote is record level password protection. With Yojimbo you can password protect important records but leave others without a password for convenience. e.g. Credit card records have a password but directions to your hotel or info on a local restaurant do not. I tested the encryption on both versions of Yojimbo. You can see the encryption icon in the screenshots for the Codes and Passwords entries. It works well. This allowed me to move that data out my previous insecure storage on both devices. Having used both, I prefer Evernote. I really have no use for the ability to password protect individual records. 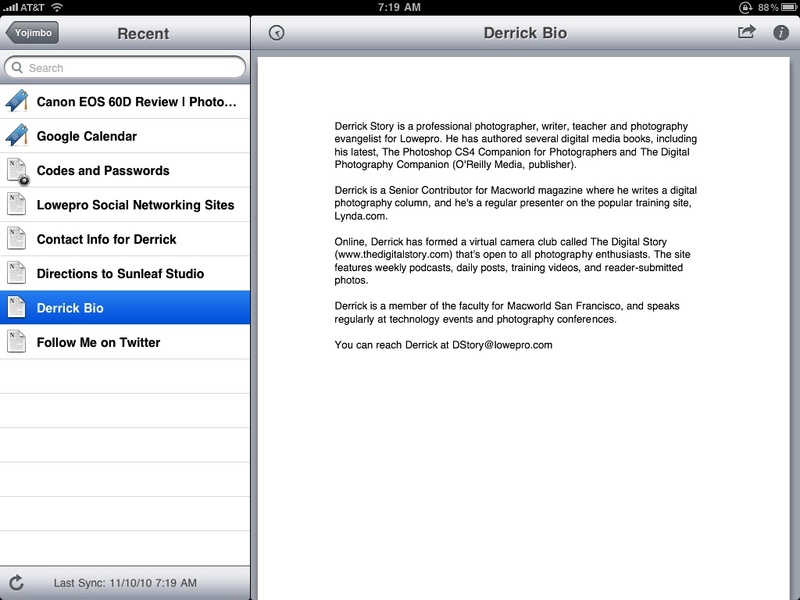 The synchronization of Evernote between my Mac, iPad, iPhone, and the web is fantastic. I used Yojimbo for a long time, but gave it up in favor of Devonthink Pro. All data that I feel the need to have on multiple devices and the internet goes into Evernote. I have to agree with Dan. I find Evernote sinple, easy, fast and quite useful. Love that I have it on the phone, ipad and mac, and when on the road I just click on the items I want to have with off-line access (like plane and hotel reservations), and no need to have internet access to have them. Also, the fact that everything is in the cloud is quite cool. Evernote could in my opinion, have a bit more funtionality on the formatting end for the content and notes that I write in it, but at the current rate of improvements, I would hope to see something soon. For the confidential information, I use eWallet, that also runs and synchs in the mac, phone and ipad.